I knew this was going to happen; When I first got the wood shell for my Sega Star Trek Captain’s Chair – Someone had already ripped several of the Leg Leveler T-Nuts from the wooden bottom. 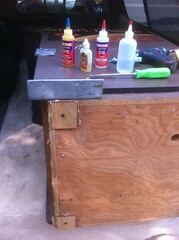 I figured – hey; can’t be a real problem so I epoxied in some new T-Nuts and went off to Texas Pinball Fest ’12 . Needless to say; three of the T-nuts didn’t make it back to Austin. Call it carelessness; or whatever, but I had to fix this. When I first saw the original t-nut design; I thought it was stupid. The tnuts won’t hold… and neither will those two massive staples the put over the Tnut. If the nut can be pulled; so will the staples. Besides; it’s not like the sell those big staple guns at Harbor Freight or any home improvement store. I whipped out Corel Draw and laid out some simple plates to “improve” the design. My goal is to make the t-nuts resistant to torque forces while keep the plates simple. Here’s my solution to help keep the T-nuts in place. You may make products based upon this design, provided you do not make more than ten [sets] in any twelve month period for your personal use. The first three items were sourced from Lowes – but nearly any home improvement store should carry these items. 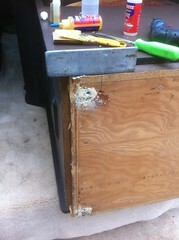 The Staples were sourced from Harbor Freight for a previous restoration project. The T-nuts from Mcmaster Carr for the original Sega Star Trek restoration. I cut the poplar sheet to fit to 24″ length so it would fit on my Laser table. Ran the Laser cutter at 50% power, 1.6 speed, 250 pulses per inch (ppi) to cut on the red lines. The Etches were vector engraved at 40%, 10 speed, 500ppi. Was it necessary to laser cut – heck no, but if you have the equipment; why not use it? Took two passes to cut through the 1/4″ poplar at these power levels. which contains the Corel Draw file and measurements in PDF form. 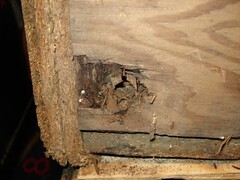 In this picture; some wood filler was used to help secure some missing wood from where the tnuts were ripped out. Be sure not get any epoxy in the threads of the tnut… one way to do this is to run a old leg lever into the hole while the epoxy is setting. The epoxy sets in 5minutes; but takes a minimum of 1hr to reach some strength; so I let the epoxied Tnut set for an hour and played some Star Trek Pinball. The plate will be installed with the arrow facing the outside edge of the machine. For the Captain Chair; the orientation of the arrow doesn’t matter as the tnuts are far enough inside the machine to not matter. For the Dedicated upright machines; the Arrow side is 0.1inch shorter; so it will not overhang the front of your machine. After the hour; I dampened the base of the machine and the plate with some water per directions on the Gorilla Glue packaging. I used the White version; because it cures in about 30-60minutes. 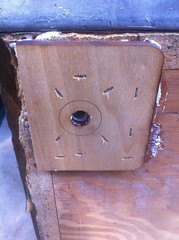 I put a spiral pattern on the wood plate and stapled it in place with the 1/4″ crown staples. The Staples provide the clamping pressure while the glue sets. Wait about 1hr for the gorilla glue to strength… At this point you can gently set the machine back on it’s legs. If you can wait at least 24hrs before any excessive moves – this will allow both the epoxy and the gorilla glue to reach full strength. This plate should be nearly in-destructible; which could prove a problem if the tnut ever needs to be removed. Not sure why that would need to happen – comments / suggestions? 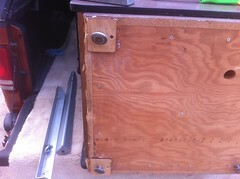 This entry was posted in Arcade, DIY, NCL, TAPR, Video Game. Bookmark the permalink.